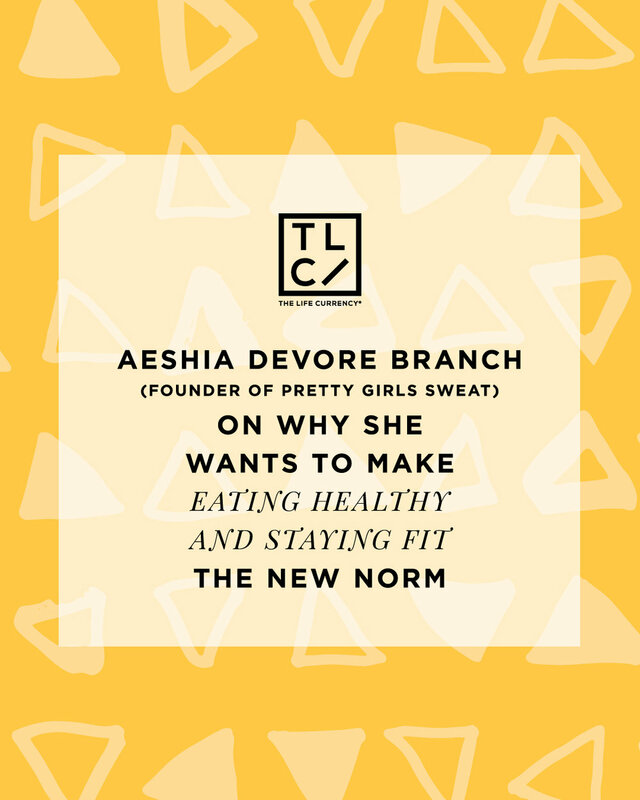 Aeshia DeVore Branch had a mission in mind when she created her socially driven media platform Pretty Girls Sweat: to help decrease high rates of obesity among youth by making fitness fun. Branch has now created a “Sweat Sisterhood” that spans from young girls to female adults, has chapters at 13 universities and unites and empowers women through fitness. We spoke with Branch about her organization, what inspired her and her tips to young women on staying active and maintaining a healthy lifestyle. Read her interview below. Former FLOTUS' Michelle Obama's Let's Move campaign inspired your organization Pretty Girls Sweat. Can you share more about Pretty Girls Sweat, and what inspired you to do this work? When First Lady Michelle Obama launched the Let’s Move campaign in 2010, I immediately felt compelled to support the fight to end childhood obesity. I was not only shocked by the alarming childhood obesity rates in the US (more than 23 million children and teenagers in the U.S. are obese or overweight) but I wanted to dig deeper and learn why and how this became an epidemic. As a former high school athlete, I learned the importance of teamwork, accountability, hard work, focus, friendship, and fun — all attributes that contributed to the woman and mother that I am today. All girls should have that experience (including my three daughters), even if they don’t make the school’s basketball, volleyball or track teams. So PRETTY GIRLS SWEAT gives all girls the opportunity to be empowered through fitness and as the initiative grows and continues to erase the negative stigma sweat holds, we hope to make eating healthy and staying fit the new norm — the cool thing to do. We train college students to be health leaders on campus and in their communities because they are at a critical age when they are making decisions on their own. From eating healthy to staying fit, no one is holding their hands. By motivating girls to bond through healthy lifestyles, they not only benefit from a support system, but as they transition into adulthood, they are equipped to lead healthy households. Women make 80% of the healthcare decisions for their families. We’re doing the footwork to stop this epidemic from affecting future generations. This video presented by Banana Republic sums it up perfectly. Can you also tell us more about your Sweat Shows that take place all over the country and even on college campuses, and how our readers could get involved? Sweat Shows are our vocabulary word for fitness parties. It’s also a play on the words "step shows.” Since we are proud to be known as a #SweatSisterhood, Sweat Shows put fitness on display using the power of social media. Our #SweatSisters are unafraid to document their workouts because they know by sharing, they’ll inspire their peers. To get involved, join our mailing list and follow us on social media for event alerts! If you attend any of the colleges where we have chapters, become an ambassador or general member. We'd also love to know more about Teen Diaries and how young women like our readers who are looking for mentors can be a part of it? After college, I worked my way up from being a receptionist to a TV producer at a cool company called @radical.media. I learned everything from on-the-job experience and internal/external mentorships but rarely applied anything that I learned in school. While working with some of my idols (including Dr. Maya Angelou and Venus Williams), I became passionate about creating positive content for teen girls as well as giving young women an opportunity to start their journalism/media careers at an early age with actual work experience. As a result, Teen Diaries was born. I partnered with my sorority sister Nicole Johnson Roberson, who is a clinical therapist for at-risk teens, and we launched this special 501(c)3 nonprofit. We connect students with mentors at our community fitness parties with PRETTY GIRLS SWEAT and give our members exclusive access to monthly career conversation calls with successful female executives. For more information, visit TeenDiariesFoundation.org. Why do you think it's important for young women to exercise and be healthy? Health is wealth. There is nothing in our life that is more valuable than good health. Without health, there is no happiness, no peace and no success. What advice would you give to young women who have busy schedules on how to maintain a healthy lifestyle and stay active? Just like success, we often hear that staying in shape is often mind over matter. Can you shed more on this and how a commitment to staying healthy and in shape is similar to committing to a successful career, building a business, etc.? Business and sports are very parallel. You need a good team around you. You’ll have some successes. You’ll fail at a lot of things. You have to learn when things go wrong. You’ll have people telling you can’t do it. You push through all those barriers. You can do it! #PrettyGirlsSweat in all situations and put in work to be their best selves. Discipline and self-motivation are key in both fitness and business. Bloom where you’re planted. STOP COMPLAINING! Make the best out of every situation. Whether you love/hate school, where you live, or your entry level job, soak up all that you can and crush your responsibilities. Each experience leads to your next BIG step so appreciate the journey. I discuss this and more in a recent episode of Cool Soror! Listen to the full interview here.